Today marks twenty years since Deng Xiaoping ordered the People’s Liberation Army to shoot down hundreds, if not thousands of peaceful protestors in Tiananmen Square. In the past two decades since, China has enjoyed enormous economic growth- mainly because Chairman Deng and his successors made a decision after the June 4, 1989 massacre that in order to retain centralized power, they would allow the people more economic freedom. The result has been a rising middle class that may be as large as 300 million and even a substantial number of super wealthy entrepreneurs who have all embraced Deng’s 1992 slogan that “to be rich is glorious”. The new focus on a more capitalist economy, however, has also meant an ever widening gap between rich and poor, with increased poverty in the countryside, weakening of the family unit as young people are forced to move from farms to cities seeking work, choking pollution, abusive police and many other negatives. It is interesting that until very recently there were few obvious signs of protest akin to the short-lived 1989 student democracy movement. This has been primarily due to the fact that while allowing economic freedom, the government has kept a tight rein on political freedom. For example, people who try to take local issues to provincial or central agencies are regularly detained in “black jails” where they may be tortured or at least strenuously persuaded to “forget” their concerns. Parents of victims of the Sichuan earthquake and tainted milk have been warned not to speak about this to the foreign press. Even with this kind of intimidation, Yang estimates that 100,000,anti-government protests occur annually in China. A growing number of lawyers like Gao Zhisheng who defended the Falun Gong have been willing to endure torture and jail. All of the government pushback demonstrates the leaders’ real fears that serious democratic reform could mean the end of their hold on power. Since that day on June 4, 1989 when the PRC turned its guns on its people, there has been virtually no discussion of what actually happened in the square on the Internet or in textbooks. The government continues to keep tight control of any information about what is officially called “the June 4 incident”. In March, mothers of students killed in the square appealed to the National People’s Congress to end the taboo against acknowledging the event not as a “political disturbance” but as a massacre. And now, a just published secret memoir by moderate leader Zhao Ziyang, created while he was under house arrest, gives a disapproving account of the bitter power struggle behind the scenes as the students occupied the square, the deep rivalries between reformists and hardliners in the leadership as well as the critical role Deng played in the decision to use force. Young people born after 1989 know virtually nothing about this history. They are rightfully proud of the positive transformative accomplishments of their country since the tragic events of 1989. Maybe following today’s important anniversary, the Chinese government will finally decide to open the door, acknowledge the true facts, and then move on. We returned home Thursday evening after a seven hour drive from Tallahassee. Wednesday night’s Florida Heritage awards ceremony, which included the Florida Book Awards Gold Medal winners, was quite special. After a successful book signing sponsored by the Tallahassee Museum, we were ushered into a “green Room” for snacks and pre-ceremony instructions, In addition to the Book Awards (“Rabbit in the Moon” won for Genre Fiction), legendary country singer/songwriter Mel Tillis and Harry Crews, prolific author of novels, short stories, essays and screenplays were inducted into the Florida Artists Hall of Fame. Margery Kinnan Rawlings (her niece accepted for “Aunt Marie”) and Gene Patterson, Pulitzer Prize winning editor of the St. Petersburg Times, were among four Florida Folk Heritage Award winners. When it was our turn to pick up our award, we had to squeeze out of our seats (several winners had brought en entourage of friends and family) and bolt onstage to smile for camera and shake the hands of Governor Charlie Crist and Secretary of State Kurt Browning. 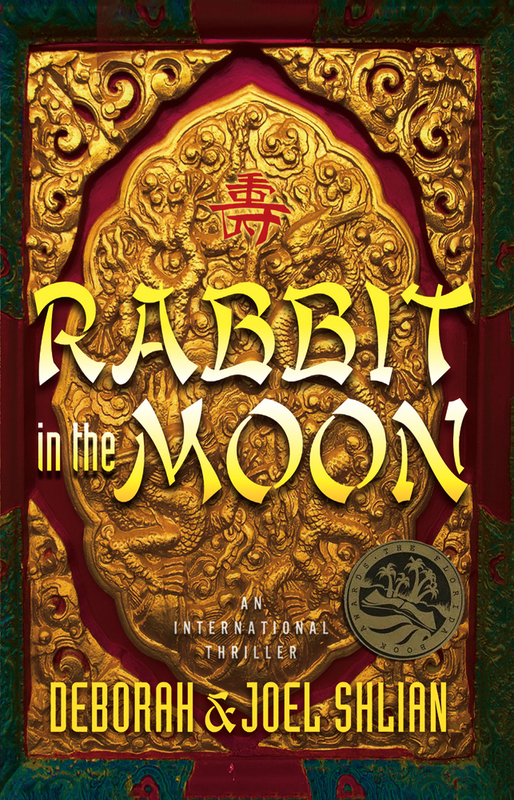 Governor Crist whispered that with a theme about China, “Rabbit in the Moon” couldn’t be timelier – that was very nice. According to the program, “Florida Heritage Month is celebrated from March 15 to April 15 and is the time when [we] recognize the importance of our state’s culture and heritage as well as the contributions of individuals and organizations.” The Florida Book Awards is coordinated by the Florida State University Program in American & Florida Studies, and co-sponsored by the Florida Center for the Book; State Library and Archives of Florida; Florida Historical Society; Florida Humanities Council; Florida Literary Arts Coalition; Florida Library Association; “Just Read, Florida!”; Governor’s Family Literacy Initiative; Florida Association for Media in Education; Florida Center for the Literary Arts; Florida Chapter of the Mystery Writers of America; and the Friends of FSU Libraries. Even though we both wrote “Rabbit in the Moon”, we only received one gold medal between us. When we left the stage, the governor asked us who would be wearing it. “I’ll wear it now,” Deb said. “Joel can wear it on the drive home.” And he did! !